Located in close proximity to all the major transport hubs and tourist attractions of Mumbai, Santacruz has become a convenient wedding location for soon-to-weds. From 5 star hotels to serene banquet halls nestled in the quiet, tree covered lanes of Santacruz, this location has a lot to offer to bridal couples who want to execute their wedding on a budget. You can find all kinds of wedding venues in Mumbai, covering a gamut of price ranges. Choosing one can be daunting, given that they meet the crucial criteria of convenience, impeccable service and don’t compromise on quality. We bring to you these exquisite banquet halls in Santa Cruz, Mumbai that are sure to meet the varied nuances of Indian weddings that might be part of your requirement. Situated in the bustling and prime location of Mumbai, Hiravati Hall is one of the perfect banquet halls in Santacruz West offering a quiet and serene space to host your grand wedding. This tastefully designed banquet space can easily accommodate over 1000 guests. The interiors feature cream and ivory walls and state-of-the-art lighting that make it versatile to setup any kind of theme décor you like. The venue offer is 100% pure veg and does not allow non-veg food or alcohol in the premises. Food and décor is skilfully handled by their in-house team. For booking enquiries and more details, click here. This multi-banquet hall in Santacruz West is your one-stop destination for a wedding on a budget in Mumbai. Offering superbly designed interiors each banquet hall is a charm of its own. Should you need a larger banqueting space, their halls can be combined for a large gathering celebration. Their in-house events and catering team ensures all your event requirements are met to the T. With a venue so flexible and versatile, (that too on budget) could you ask for anything more? Located stone throw away from Santacruz station, Samruddhi Grande Banquet Hall is a spectacular location to host an indoor pre-wedding or wedding festivity. Splendid interiors and impeccable service welcome you at this purely vegetarian venue. This classy banquet hall in Santa Cruz, Mumbai has in-house décor team that stages the interiors in a flawless manner, creating a regal romantic ambiance you dreamed to have at your wedding. Their catering service too is beyond excellence. 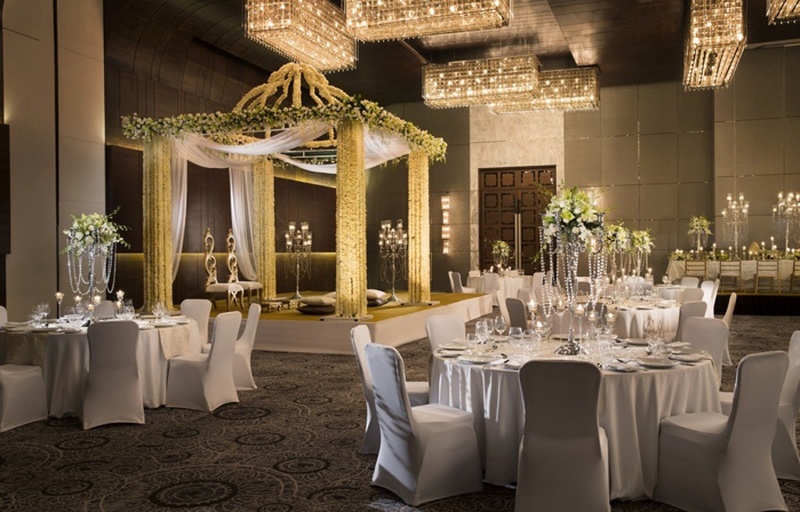 If your wedding budget is not a constraint and you’re all out ready to splurge on this once-in-a-lifetime moment of yours, then the wedding venues at Grand Hyatt in Santacruz, Mumbai, is ultimate destination. For a big fat Indian wedding, you can either choose their 11,600 sq. ft. indoor grand ballroom or lush green outdoor exhibition lawn that can comfortably accommodate and tend to over 2000 guests. This 5 star wedding hotel in Mumbai has a hands-on events team to take care of your décor, catering and music arrangements. Dheeraj Heritage Garden concludes our list of popular banquet halls in Santacruz. This wedding venue offers a sprawling 28,000 sq. ft. terrace top space that makes it simply perfect for you to host an open-air wedding with the stars and Gods witnessing your dream union. What makes this all the more a perfect choice is the breathtaking view of Pawan Hans and Juhu that the venue offers adding an enchanted element to you celebration. Check out more such amazing wedding venues and banquet halls in Santacruz, Mumbai here.